And I’m not even talking about the financial markets, although Friday’s whipsaw action in big tech names was a notable exception. The Dow was up about 0.3% on the week while the S&P 500 was down 0.3%. Tech looked like it was going to lead again this week until Friday’s plunge. The Nasdaq lost about 1.6% on the week. The FANG stocks - Facebook (FB), Amazon (AMZN), Netflix (NFLX) and Google (GOOG) - all posted losses in the 3-4% range on Friday. Friday’s move was interesting in that it marked a decided move out of tech stocks and into financials and small caps, two areas of the market that have underperformed in 2017. Is it a sign of a broader change in market leadership? Hard to say based on just one day but many tech stocks are in overvalued territory and a modest pullback from current levels wouldn’t necessarily be a bad thing. The big event on the economic calendar is this week’s FOMC meeting culminating in Wednesday’s interest rate decision. The market is widely expecting a 25 basis point hike but keep an eye on the statement following. I wouldn’t expect to hear anything particularly unexpected but the Fed could move to a more neutral, or even hawkish, tone based on recent mixed data. The headlines this week were dominated once again by political news. The Comey testimony turned into must-see-TV. Nearly 20 million people tuned in, a number that rivals this year’s NBA Finals. And that doesn’t even count people who watched it in bars or restaurants or streamed it live online. Over in the U.K., Prime Minister Theresa May’s decision to call a snap election three years ahead of schedule in order to increase her leverage in the Brexit negotiations backfired drastically as not only did she not increase her party’s majority but actually lost it altogether. In the coming Fed-driven week, here are my four ETFs to watch in the coming days. 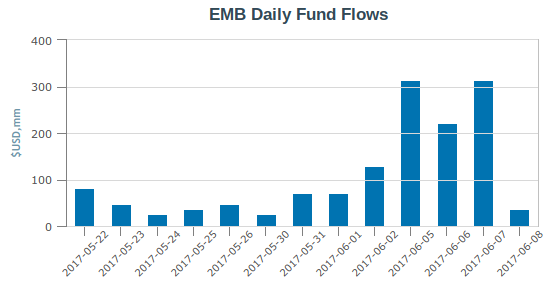 Money has been pouring into emerging markets debt funds for the past few weeks and no ETF has been a bigger beneficiary than EMB. The $12 billion fund has added nearly $1.5 billion to its asset base in just the past two weeks. The rapid influx of cash will no doubt raise questions about the fund being able to effectively put it to work without watering down the portfolio, the same issue that impacted the VanEck Vectors Junior Gold Miners ETF (GDXJ). The fund has posted a modest gain thus far in 2017, but investors are no doubt enticed by its dividend yield of nearly 5%. The semiconductor sector has been one of the top performers in 2017. The group is still up 19% year-to-date even after Friday’s nearly 4% drop. Prior to Friday, the semiconductor ETF posted 9 all-time closing highs in the prior 10 trading days. The sector has been powered by big gains in Nvidia (NVDA) and Applied Materials (AMAT) and has enjoyed strong NAND and DRAM demand. At 23 times earnings, the semiconductor group is expensive but, for now, it’s got a solid business environment backing it up. The financials have largely struggled in 2017 as President Trump’s plan of eliminating regulations looks like it’s going to have a tougher and tougher time getting through Congress. I wrote an article earlier this week talking about why I felt the sector was a prime “buy the dip” candidate. I won’t rehash it here but click on the link if you want read about what I think the short-term catalysts for the sector are. The financials were also a beneficiary of the sector rotation on Friday. Valuations are reasonable so investors could be looking at a potential value play here. The small caps were up 1.4% this week reversing a trend of underperformance most of the year. There’s some concern that when small caps give up leadership to large caps that it’s an indication the market is nearing a top. Up to this point, there hasn’t really been an indication on the economic front that things might be swinging the other way (although Wednesday’s Fed statement could provide some hints). 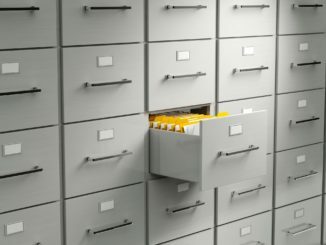 Keep an eye on whether or not the small caps continue to lead again this week.